The impressive Burj Khalifa tower of Dubai is not just an iconic symbol of this city in the UAE, but most importantly a visionary architectural work in which science and design were combined to reach the highest levels of perfection. Travellers coming from all corners of the globe marvel at the sight of the tallest building ever built when it shines in the sun as much as when it gets illuminated at night. No other construction in the world has more floors, no lift travels longer distances than the ones inside it and no observation deck in the open air offers such breathtaking views elsewhere. From virtually every spot in town you can look up and be amazed by its 828 metres tall; however, those who do not suffer from vertigo simply refuse to miss out on such a unique experience and book passes to the attraction known as “At the top-Burj Khalifa” thus being able to enjoy the views of Dubai’s skyline from inside the tallest skyscraper in the world, surrounded by the utmost luxury and even having a drink. If you decide to stay in a hotel near the Burj Khalifa you will get –in addition- all the advantages of a central location like Downtown Dubai, a true paradise for shopping lovers, business travellers and adventure seekers. Below, you will find our recommended 5-star hotels in Dubai, all of which feature views of the highest tower in the planet. Strategically situated close to the world’s tallest building, the Taj Dubai lies within short walking distance of the financial district, the Dubai Opera, the Dubai Mall and the Mall of the Emirates complex, while DXB International airport is easily accessible by car or metro from this specific area. Both the Business Bay and the Burj Khalifa subway stations are less than one kilometre away from the hotel. This 5-star hotel in downtown Dubai, which features among its numerous amenities an outdoor luxury pool, complimentary WiFi connection all throughout, a spa and fitness centre, a selection of onsite restaurants specialising in foreign cuisines and a night club known as the “Billionaire Mansion”, offers unparalleled panoramic views to the Burj Khalifa tower from its luxury rooms that can accommodate couples or families. If one of the reasons why you will visit Dubai is its vast array of exclusive international brands and so want to spend lots of time at the shops, know that this hotel near the Burj Khalifa has direct access into the Dubai Mall from inside its own facilities. Other attractions within short walking distance include the Dubai Aquarium, and guests may request airport pick-up and drop-off service for an additional charge. During their stay, guests are invited into exclusive luxury spaces such as the three swimming pools with stunning Dubai skyline views, the various onsite restaurants offering the finest international dining options, a spa centre, a shisha lounge and a gym. Each room is fully-equipped, provides a Nespresso coffee machine for personal use as well as technological features such as an iPad to adjust the lighting and temperature to one’s liking. Travellers who book a Club Room get complimentary limousine services, earlier check-in times and round-the-clock access to the lounge. This 5-star hotel in central Dubai featuring views of the Burj Khalifa skyscraper boasts an enviable situation right by the main metro station in the area and only a stroll away from the Dubai Mall, the Business Bay and the City Walk. If you opt for hiring a vehicle to get around, you will be glad to find out that the Sofitel Dubai Downtown hotel provides confirmed guests with private parking spots. The luxury suites and rooms of this hospitality establishment may feature views of the popular tower, the city or the coast, or include different packages that will entitle you to benefit from extras such as spa treatments, club access and meals. Among the varied choice of dining options on site we count Peruvian, Argentinean, Japanese, African, American and Australian. Furthermore, during your stay you can enrol in yoga classes, receive advice from a personal trainer, relax at the pool bar or plan your city tours at the information point in the reception. Have you got everything sorted out for your trip already? 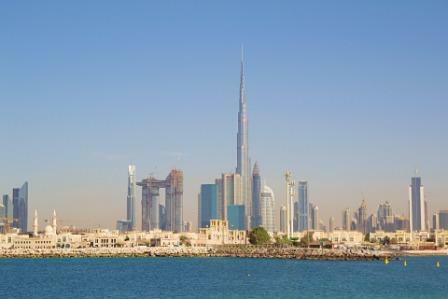 Our post about how to get your tourist visa to Dubai might be of interest to you.